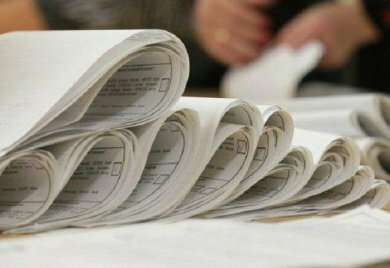 The Central Election Commission (CEC) of Azerbaijan has started distributing ballots to constituencies in connection with the April 11 presidential election. During a meeting held at the printing house of the Azerbaijani Parliament with the participation of CEC members, the leadership and staff of the CEC Secretariat, chairpersons and secretaries of constituencies, representatives of media, international organizations, as well as various subjects of the election process were provided with the opportunity to monitor the process of distributing ballots. On April 2, ballots will be delivered to constituencies in the Nakhchivan Autonomous Republic, to polling stations set up in Azerbaijan’s diplomatic missions and consulates abroad, to constituencies to which polling stations created in sailing vessels in accordance with the Election Code belong, in total to 41 polling stations, including those set up in the country’s remote regions. In the following two days ballots will be sent to all other constituencies in the country. The printing of ballots were carried out in high security conditions provided by the Special State Protection Service. The process of transportation, storage of ballots and their distribution to polling stations shall be carried out by the Interior Ministry’s relevant bodies. The printing of ballots for the upcoming presidential election in Azerbaijan was launched on March 24. In connection with the presidential election, 5,347,803 ballots were printed. The ballots will be published within a week and they will be delivered to the constituencies five days before the voting day and to polling stations three days before the voting day.